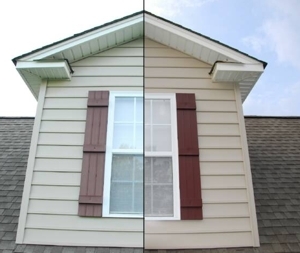 Why restore your faded shutters and vinyl siding? Spruce up the curb appeal of your home with brand-new looking shutters. 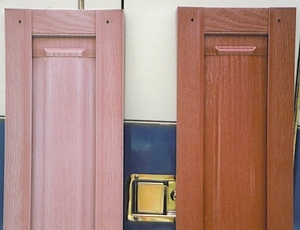 We can bring back the color and luster of your shutters and highlights the wood grain that makes them beautiful. Once you see the beauty that was hiding behind your faded vinyl, you will want to spruce up all your faded surfaces. We can also restore your faded and oxidized vinyl or aluminum siding. In addition, when you restore your shutters instead of replacing them you’re helping “earth beauty” as discarded vinyl products stay in the Earth’s landfills for thousands of years. Be green, and restore not replace. The average builders’ grade shutter set is around $35. Replacing 7 sets of shutters will cost you $250 and that does not include paying for labor to install them. Better quality shutters or custom sizes shoot up into the $100’s of dollars per shutter. 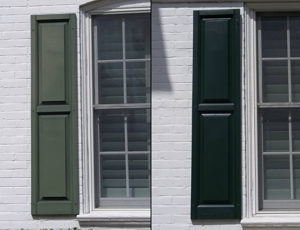 For a fraction of the cost we will restore your dull, oxidized and faded vinyl shutters to like new, while protecting them from future fading. You can restore the color and luster of your faded shutters in a few hours while saving hundreds of dollars over buying new vinyl shutters! Painting your shutters costs you lots of money (buying primer, vinyl ready paint, tape, rollers, etc) and most importantly time and headache. Painting requires taking down your shutters and putting them back up, our process does not. To make it even worse, paint will fade again in a few years then you will be back to square one.